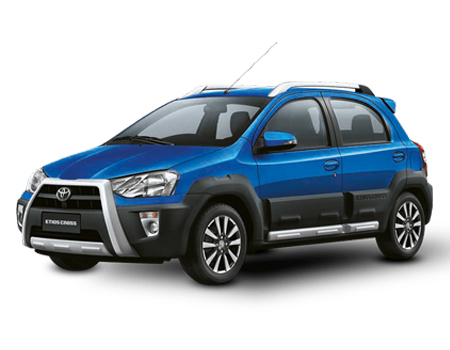 The Japanese manufacturer Toyota has expanded its list of eminent cars, and Etios Cross is a part of the same list. Embracing host of fantastic features, this compact crossover has initiated grabbing onlookers in Indian automotive industry since 2014. This pre-eminent car adapts the platform of its sibling Liva, which is further accentuated with rugged exterior appeal and sturdy appointments. l Bold, tough and robust, the new Etios Cross shows an intimidating external facade at its first sight. l Its masculine front grille is accompanied by nudge guard finished with silver accents. l To give a distinct appeal, this compact crossover is polished with laminated windshield glass and incorporated with wipers. l 15-inch alloy wheels coupled with 185/60 R15 tires enhances the robust character of Etios. l Overall exterior dimensions of this car measure as 3895 mm x 1735 mm x 1555 mm (L X W X H) and the wheelbase is about 2460 mm. What to opt for: The premium crossover by Japanese automaker comes fitted with various exclusive exterior parts, hence it will be a good alternative to insure all the fitted parts with additional accessories. l The plush interior of new Etios Cross is boosted with piano black color scheme perfectly complements its overall outline. l In terms of infotainment, this car comes fitted with 2-DIN audio system featuring CD/USB/AUX-in and Bluetooth connectivity turns your ride into an interesting one. l Equipped leather wrapped 3-spoke steering wheel and illuminated supervision cluster completes the designing of this crossover. l Chrome finished ac vents on the dash creates a pleasant temperature for the occupants. l The 251 litres of boot space allow you to store your amenities with ease. What to opt for: The new Etios Cross wraps plenty of exquisite and classy aspects employed with high-end technologies, thus insuring all the expensive parts might make you feel confident about the drive. The latest generation Etios Cross by Toyota directly competes against the Italian automaker's Fiat Punto Cross. When it comes to its maintenance expenses, and entire price range, the complete insurance of your vehicle would be a smart choice, in addition the consumables add-on serves as an extra advantages.